In the spirit of awards season, African Americans in the LGBTQ community took their bows and trophies at the Second Annual Truth Awards Gala and Dinner on Saturday, March 5 at the Taglyan Cultural Complex in Los Angeles. Unlike the Academy Awards with its #OscarsSoWhite controversy, the Truth Awards celebrated self-identifying African American members of the LGBTQ community, whose accomplishments have positively impacted the perception of Black LGBTQ representations. No envelopes were needed because all the names called that night were winners. One by one, the honorees took the stage and shared “their truth,” trials and tribulations of being Black and gay in America. The Truth Awards are presented by award-winning actress Sheryl Lee Ralph, The DIVA Foundation and Better Brothers Los Angeles. The event was co-hosted by media personality/talk show host and actress Rolonda Watts (“Dr. Drew” on HLN and “Rolonda”) and Karamo Brown (TV One’s “The Next 15;” host of “The OWN Show” on Oprah.com; and MTV’s “The Real World: Philadelphia”). The black-tie affair honored African-Americans, trailblazing men and women whose personal and professional accomplishments have positively impacted the perception and image of the Black LGBTQ community. The Truth Awards embody the belief that members of the Black LGBTQ community and its allies who embrace and live their truth should be recognized and honored. Presenters – namely, allies from Black Hollywood – included Margaret Avery (“Being Mary Jane,” “The Color Purple”); actress Kelitta Smith (“The Bernie Mac Show,” “The First Family”); reality stars Wendell James (“Raising Whitley”); Milan Christopher (“Love and Hip Hop Hollywood”); Miles Brock (“Love and Hip Hop Hollywood”); Darryl Stephens (“Noah’s Arc”) and media personality Nerissa Knight of KTLA-TV – just to name a few. Grammy-nominated powerhouse singer/songwriter and LGBTQ activist Frenchie Davis really sang – a couple of numbers, then brought the house down with her rendition of “Home,” from the Broadway play, “The Wiz.” Last year’s Courage Award honoree, award-winning producer, singer/songwriter B. Slade graced the stage to serenade Lifetime Achievement Award honoree, Bishop Dr. Yvette A. Flunder. 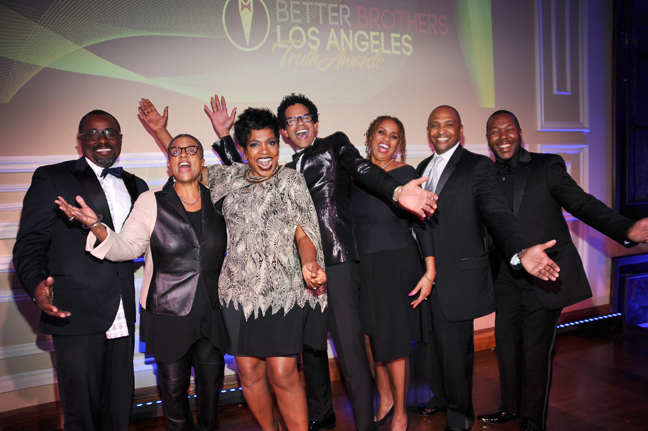 The DIVA Foundation and its founder Sheryl Lee Ralph are especially pleased to continue their partnership with Better Brothers Los Angeles (BBLA) on this effort. Both organizations believe a healthy Black community – one where individuals are allowed to live their truth, free of shame and stigma, and are recognized as equal and rightful members of the community – is a critical piece in the fight to also end HIV/AIDS. This year’s honorees were picked from various fields, including the creative arts, entertainment, business, law, politics, and the ministry. “It’s important that we uplift and recognize the accomplishments of African Americans in the LGBTQ community, who are living their lives unabashedly out loud and openly for all the world to see,” says Ralph. “Hopefully, by celebrating the courage of these gay, lesbian and transgendered individuals, we will encourage, inspire and motivate others to live their truth.” Notable allies in Black Hollywood will join Ralph in presenting the awards to the Truth Awards honorees. The Truth Awards is sponsored by the office of Supervisor Mark Ridley-Thomas, Gilead, Leaders Up, KTLA-TV, AHF, New York Life Insurance, and Columbia University-IRAAS. Special thanks to Miss Jessie’s, The Healing Place, Naked Juice and eONE.